The only kind of tea that I drink is Sweet Tea. Growing up in the South, Sweet Tea is what we drink. Sitting on the front porch, sipping a tall cold glass of sweet tea is just what we do around here to relax after a long day. With every meal and served at every restaurant, sweet tea is more than just a southern staple. Sweet Tea is a way of life. Always served ice cold, sweet tea is like a good cup of coffee. In every true southern belle’s fridge sits a pitcher of Sweet Tea ready to be served. Since sweet tea is one of my favorite daily indulgences, I thought I would share how I make the perfect glass of sweet tea. Some may think that Sweet Tea has some sort of “secret ingredient”. But this simply isn’t true. There is only one rule to really good sweet tea and that is the sweeter the better. The brand of tea bags doesn’t matter that much, although some may swear by Luzianne, so long as it is black tea. Most boxes of tea bags are black tea. I typically will just pick a store brand to save a few pennies. But please note that instant tea is no good here. I prefer to use single tea bags versus family size, but really any size will do. In a gallon pitcher, add two cups of granulated sugar. Fill the jug with hot water (I just use hot tap water because it’s quick and convenient). Place 10 single tea bags in the jug and allow to steep for 30 minutes to 1 hour. Remove tea bags and squeeze out excess tea from the bag before discarding. With a slotted spoon, stir the tea until the sugar on the bottom is completely dissolved. Refrigerate overnight because sweet tea always tastes its best on the second day. Serve in a mason jar filled with ice. Sweet Tea is at it’s best for about 2-3 days after making. If you notice that the tea has become cloudy, it is no longer good and it’s time to make a fresh batch. IMPORTANT NOTE: if you plan to serve this sweet tea recipe cold from the fridge WITHOUT ice, then reduce the sugar to 1 1/2 cups. As the tea sits in the fridge it becomes sweeter. The recipe as it is written is to be served in a glass filled with ice. I picked up this gallon glass dispenser, I thought it was absolutely perfect for holding my tea in the fridge and oh so easy to refill my glass when I’m running low. I have a pretty good collection of mason jar tumblers, my husband might say that I’m slightly obsessed with them. I love Alladin’s products because in the south we love to sip our sweet tea from a regular mason jar, but those glass jars can be a bit heavy to carry around the house and are best saved to serve with supper. So on the go, I love the convenience and the lightweight feel of the travel mason jar tumblers by Alladin, that way I’m never too far from my favorite beverage. Sweet Tea and Mason Jars are a perfect Southern pair. What is your favorite beverage? We have always served our sweet tea in mason jars. It just doesn’t taste as good any other way. I’ve also found that when I stir with a whisk, the sugar dissolves much faster and more thoroughly. The Aladdin dispenser is adorable. I completely agree! Mason jars are the best. I don’t think I have a long enough whisk to reach to the bottom of that gallon container. I use a slotted spoon to stir the sugar to make sure it dissolves well. I am from New Hampshire and just love sweet tea which I can only find in the South. I have asked so many people, even those who have lived in the South. Make tea and put sugar in it, they say. Sun tea is pretty close but not the real thing. I can’t wait to give your direction a try. Thank you so much. I am pretty excited. If I can make your “sweet tea”, I will feel like one lucky person. That is so awesome @Andi, I sure hope the recipe turns out great for you! I live on the Mississippi gulf coast. We boil our tea on the stove. If they are the big bags of tea I just boil about 2 with a pot ful of water. Once it comes to a bowl I pore it in a jar with a cup of sugar and stir. Bam it’s done. Sometimes my dad would pick fresh mint leaves and stir those in and that’s tasty to. That’s awesome, Mindy. Thank you for sharing. I find it so interesting hearing how others make their tea. I may need to try the mint leaves in my sweet tea sometime, that sounds so refreshing. I love mint! The perfect beverage for hot summer days! Thanks for coming and linking up at The Weekend Social. Your post has been pinned to our board! Please be sure to come back next week starting Thursdays at 9PM EST on culinaryflavors.gr ! I hope to see you there! I’d love to try this recipe for REAL Southern Sweet Tea, but I’m in early diabetic stage. What could I do to adapt this recipe for myself, if anything..? I make my dad-a diabetic-sweet tea weekly. I use stevia leaf extract. He loves it. I hope you enjoy it! On the stevia pkg it givesyou measurement equivalents. That’s awesome Franceska!!! Thanks for sharing. I would love to hear what you think. Remember to serve in a tall glass full of ice as it can be quite sweet without it. I love sweet tea and my stepdaughter makes it with Plantain Mint tea (Bigelow is the brand). She does a combination of the black tea and the mint tea..this is excellent if you like mint flavor. I LOVE peppermint tea! I usually have peppermint tea in the morning for breakfast or as a treat when craving something sweet. I love to combine peppermint tea with the rich flavor of black tea. It’s a personal favorite for me as well. Thank you so much for sharing. I could talk about tea for days. I absolutely love the stuff! I prefer Lipton tea bags and you are totally right on using the single serve bags over the family size. The taste never comes out quite right with the larger bags. Oh my goodness, I will save this post! My husband loves tea like this and will appreciate it big time I’m sure! Jaclyn, I’m sorry but I believe that is a myth. I’ve lived in Georgia my entire life and learned how to make southern sweet tea from my mom who learned from her mom, and so on. For generations we have been making sweet tea this way and never once has anyone (family, friend, or otherwise) ever mentioned putting baking soda in their tea. Baking soda is not a true southern tradition, I think that is more a “Pinterest hack” or what a restaurant might do to help keep the tea from going bad when making large batches ahead of time if anything. That’s just not how we do things around here. There is no need in messing with the traditional recipe, in my opinion. Besides, southern sweet tea drinkers typically make a new pitcher of tea everyday or every other day. It is too good to stay around for long. ? We make tea by boiling it also. I use Liption family size bags. (We like strong tea.) I use 5 for a 2 gallon glass jug & boil those in a big saucepan full of water. Turn it off once it boils & let it sit for 10-15 minutes. Then I add 2 & 1/4 cups granulated sugar to my 2 gallon glass jug. As I pour the hot tea over the sugar I run some cold water in the jug too (as to not crack the jug, from the hot tea!!!) STIR, STIR, STIR!!! Until all the sugar is dissolved & your jug is full of tea. Taste it to make sure it has enough sugar & water. Serve over ice, w/lemon, or plain. DELICIOUS!!!! I would consider Texas as “southern”. 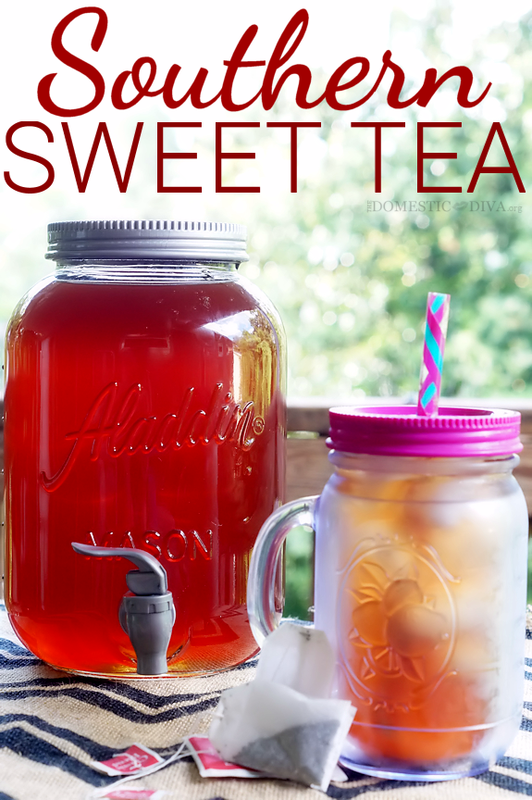 Thank you for sharing how you make your sweet tea.